I have been busy doing lots of different jobs since the weather has been improving. It's been tough to sit down inside and work when the sun is out and getting warmer each day. The Western Bluebirds and Turkey Vultures are back and that's a sure sign of Spring. Here's the update on my partially torn mcl ligament. Three weeks ago I was given an injection after no improvements during the prior 5 weeks. The injection is called PRP, which stands for platelet rich plasma and thankfully that has lived up to its hype. I am finally able to sleep better, have less pain throughout the day and am gaining full range of motion. It is still going to be a long haul as I am not doing any cardio or strenght training yet. Cardio will be introduced first and that will give me a base to eventually begin strenghtening exercises for my quads and hams. My oh my how fast the muscle disappears. At least I was able to avoid surgery and I credit the years of weight lifting to the fact that this is only a partial tear. Clearly I will be walking in circles to the left come Fall. I have already informed my hunting partner John of this and he just chuckled. With any luck they'll be big circles. I have also been spending time outside raking pine needles and generally cleaning up from Winter. It has been great to be outside without having to wear 5 layers and feel the sun warming my skin. Mind you though we just had 6" of snow a week ago. That's how fast things can and do change here on the high desert. I have also been doing some Spring cleaning inside my house and garage. Putting away random items from a lingering damp Spring. One item of particular note was the retiring of my first real hunting hat. The Elmira Fudd hat as hunting partner John called it. It was time and I knew it was coming for awhile. After I stepped in that Beaver hole and took on pocket water filling the back of my game vest and also my hat, while drying it over the wood stove it shrank considerably. I tried to gently stretch it out but to no avail and one of the chin strap ties broke too. The hat was an original from L.L. Bean that I bought back in 1978. They no longer make them and had I known how much I was going to use it I'd have bought another just to have in reserve. These days I do buy two of something that I know I will use especially if it seems like it might not be around for long. So I said goodbye to my old chapeau and thank you for the many miles we've travelled together. Your service was first rate and unparalleled. You will be greatly missed and remembered fondly! The other bit of business that has kept me away from writing posts has been the little wood wagon. This project was completed and delivered this past Thursday and the new owners were delighted. A bit of history about this project. I have built several items for this couple including a coffee table, entertainment center and a side table all designed around their dining table. They now wanted a new wagon to match the rest of their furniture. 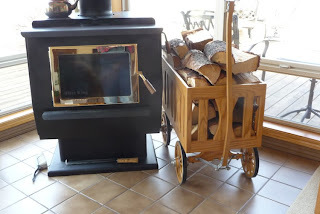 This wagon is used to bring in firewood from their garage and sits next to the wood stove, all in one clean trip. 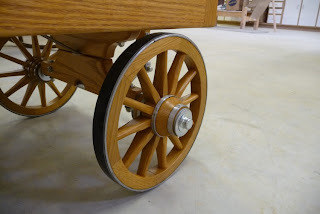 After much discussion and research on all our parts and some trial and error we finally were directed to an Amish fellow who builds wood wagon wheels. To make a very long story shorter we got the wheels and undercarriage hardware a year after we began the project. It took some figuring and correspondence to the wheel builder to get the information required to assemble the undercarriage. Suffice it to say after a few phone calls and 2 letters with some drawings we had what we finally needed. We then had to provide the axles, nuts, bolts, washers and do some machining. The fellow I built it for he and I spent 2 days laying it out and getting the proper hardware and doing a mock up with a piece of 3/4 plywood. Eventually we succeeded. This was prior to my injection which laid me up for a few days and there after limited my activity for the following 2 weeks. My job was to build the upper rails, sides of the wagon, color stain and lacquer to match the rest of their furniture. Also trying to find a material to cover the steel band that wrapped the wood rims so as to not damage their tile and carpet. I eventually tried tuffy tire liners and they worked great. Tuffy's are a flexible plastic that are used on bicycle wheels and placed between the tube and inside of the tire to prevent punctures. I used 2 coats of contact cement on both surfaces and it worked fine. Then cleaned them up and trimmed off the excess width. 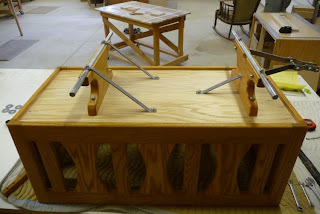 It took considerable time to make the upper assembly and then do the finish work. The wagon rolls with ease and maneuvers nicely. All in all I was very pleased with the final results. Best of all so were my friends who I built it for. It wasn't long after I hired him to work for me that he returned the favor and a fast friendship began. What a pleasure indeed. A few days ago I received a new product called Pineapple Jerky from Jerky.com to give a try and share my thoughts about it. Well at first thought it sounds a bit like a contradiction, although give it a shot because I think you might be pleasantly surprised. I was a bit skeptical at first then it wasn't much after my first bite I thought to myself, mmmm I think they're on to something here. Wishing I had thought of it first. 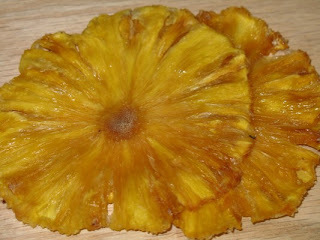 Anyhow, it has a bit of zip from the pineapple and just a touch of sweetness from the honey. It really is more like jerky than not, and not something you chew twice and swallow. It takes a bit more chewing just like meat jerky. It's good, plain and simple. It packs easy and will be great for summer hikes, cycling and hunting next Fall. A definite must for my day pack. It is a USA made product from start to finish and we need more companies like this these days. They're products are to numerous to mention them all here. Just a few highlights in my opinion that I'll mention. They have the widest selection of USA made jerky products. They have pre packaged jerky for shipping to military personnel as well as giving a 10% discount for such purchases. The last item of interest to me was the fact that they have many types of jerky without MSG. Saving those of us with sensitivity to MSG a few unwanted headaches. They also have a user friendly web site and easy ordering. 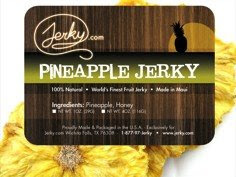 Even if you're not a pineapple fan there are lots of other choices of jerky products to try. Check out the reviews at their site and give them a call. Do a little something nice for yourself. Find your favorite jerky at jerky.com, you can tell them the Head Quail sent you. Oh, and free shipping. Disclaimer: No financial gains were made for made for this impartial review. Oh how fast the time passes. My hunting companion and trusty retriever is now 9 years old. I remember like it was yesterday when I first brought her home. Technically her birthday is March 12 but we celebrate birthdays as birth weeks around here with my friends. 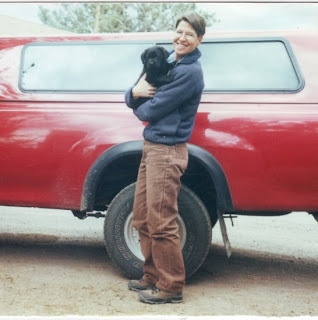 My friend Dan told me about a local Lab breeder who had a good track record with hips, eyes and quality working dogs. They are of English descent and not the high octane American field trial dog stock. They tend to be a bit heavier boned, deep chested and with a good square blocky head confirmation.I contacted them and put my name on the list for a female out of their next litter. I was partial to Yellow Labs at the time and such was my request. Although as luck had it there were only black females in the litter. That was just fine and so I began visiting the breeders when the pups were 3 weeks old. That was my first look and I had an idea which one I was going to pick. I visited each week until the 7 th. week when I finally brought Jet home. She was a little chudpuppy (as in short and plump) and I instantly fell in love. I had her dog crate in my bedroom with a cardboard box filling more than half of it. Preparing for house breaking by using the travel kennel is a great way to teach the pup to ask to go outside to do their business. She was a fast learner and sure there were a few accidents that were my fault and not hers, typically the trainer is wrong and the dog is right. Sometimes we're just a touch slow or to proud to admit that. So the fun times of puppy hood and frivolous play were the norm with an occasional toss of the dummy. It was great to watch her antics and what made her tick. She was easily amused and such a calm puppy. It was hard to break myself away from her for work and the daily chores of housekeeping and lawn mowing etc. She let me know just how displeased she was with me when I put her in her crate. Still to this day if I leave her in the truck she voices her opinion. Mostly when there are other dogs around and she isn't given the opportunity to meet and greet them. We started the obedience training early and she was a quick learner. When we moved onto working with the dummy and raising the bar she was not in full agreement. This is when I thought UH OH, time to get professional help. I found a trainer just a few miles away from where I lived and he taught me how to work with Jet. It was some of the best training I've ever had. Learning from the dogs point of view, and that was the key. From there on we began to learn together. Training began to take on a whole new perspective and we continued to make progress. Jet was not the typical in the water all the time type of Lab. She had fallen in the water at the breeders when she was just 4 weeks old and I think that initial experience made her apprehensive of water from there on. I had a pond at my old house for irrigation and I did everything I knew to get her excited for the water and she just never did flip the switch. She would walk in a few steps and then refuse to go further let alone swim. Back to the trainer again we went. He gave me some tips and we were back on track again. Fall was nearing and I knew I had to see how she was around guns. I took her out to the trap club and parked a 100 yards away and sat with her and watched her response. All was fine, so we moved closer and sat in the parking lot. Again, she was not bothered in the slightest and she wanted out to play with the other dogs. Alright, I got her leash on and she hit the ground running. She had no problem with shotguns and all the excitement. It helped having older mature hunting dogs there to distract and build her confidence. Phew, a major milestone and now I was eager for the hunting season to start. The beginning of waterfowl and Jet is 6 1/2 months old. The first year or two she wasn't having much fun and I was concerned that maybe she wasn't going to be the retriever I had hoped for. She didn't want to swim and didn't seem to have much interest in retrieving waterfowl either. WOW, maybe I have a real nice house dog I thought. 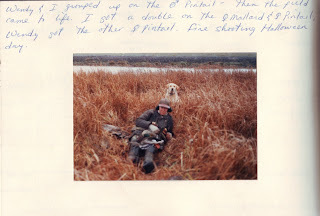 Over the first few years I was hunter and retriever. I logged a lot of miles in neoprene chest highs which is where my my dislike for them derived. I was trying to set her up for success and making the connections between BOOM, BIRD, RETRIEVE. Well, it was a slow progression and I would dump a bird out of my game bag as we walked the dikes and on our way back I would get her excited and then ask her where's the bird? Get the duck and gesture ahead of us and eventually she figured it out and started showing some enthusiasm in retrieving. This was all about building her confidence and making a big deal out of her successes. Even the small things I showered her with praise. Over time she began to show more interest and started enjoying herself. 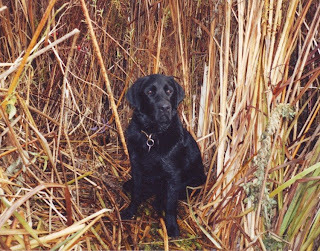 Occasionally she even made some retrieves in shallow flooded fields and then swimming the ditches for ducks. I was starting to believe that I was finally going to have a hunting dog. By year 4 she was getting the hang of it and showing a real passion for scenting and flushing Pheasants. I spent as much time as I could chasing Pheasants and to this day they are her absolute favorite quarry, bar none! She takes on a different persona when hunting Pheasants and is as focused as any dog I've ever seen. Not only that, but if there is a Pheasant in the tules, brush or briar's she will not quit til she flushes it. Equally exciting for her is flushing and retrieving Snipe. Although we don't get as many opportunities to hunt them since they migrate through quickly most years. Another of her favorites is working the cover when there's a heavy hoarfrost and it's about 10 degrees. She comes busting out of the cover, covered with frost all but her eyes and nose. Bouncing in her step like a young pup and totally fired up with piss and vinegar. Talk about happy and joyful, such a fine example. It has been an absolute delight to be her mom and see how she has grown into the fine hunting dog that she is today. Her swimming retrieves have come a long ways and even though she is not the strongest swimmer, she will give it all she has. From wading in flooded fields to swimming ice covered rivers for late season Whistlers, I wouldn't trade her for nothing! 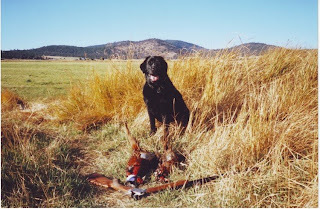 She is a wonderful huntress, retriever, companion and friend. My shadow, who has taught me the most about training and working with dogs. Loyal, easy to be with and this huntresses best friend. I am not sure who knows each other best, me her or visa versa. Regardless we are attached at the hip and I can't imagine not having her in my life. She has slowed down this past year and I know the day will come when I am looking for another pup. Until then I will do my best to reciprocate the love she continues to give me and take her hunting for as long as she is able and willing. I dedicate this 100 th. post to Jet and her 9 th. Happy Birthday week! This is a delicious and simple recipe that in my opinion is one of the best for Snipe. Being that Snipe are small I suggest using this as an appetizer and savoring each bite. 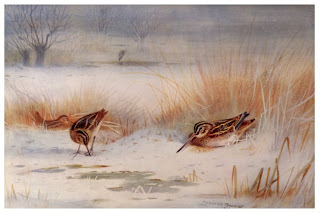 If you are fortunate enough to have plenty of Snipe, than make it the main course and figure 4 to 5 birds per person. Mix all ingredients less Snipe and bacon. Par cook bacon and set aside. Cut backs out of Snipe leaving legs and wings (to first joint) attached. Add Snipe to marinade mix and leave for 4 - 6 hours. Remove Snipe from marinade and wrap 1/2 strip of bacon around breasts securing with toothpicks. Place Snipe on BBQ with white hot coals and cook til bacon is done and Snipe are Medium Rare. You can also broil if you're out of charcoal or if you'd rather cook indoors. I have prepared Snipe this way and let me tell you, it is hard to stop eating them. They are mouth watering delicious and you'll make a note to self remembering to harvest more in the upcoming season. Bon appetit! The following story is by another woman named Teri who spends a lot of time in the saddle and out in the mountains. 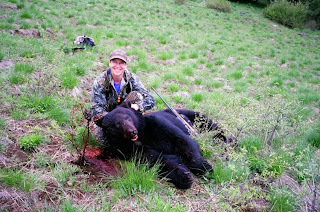 I hope you enjoy her story of how she got her first Black Bear. My husband Kevin and I lived outside of Pilot Rock Or. at the time. In the summer we rode for a cattle rancher checking his cattle in mountain pastures near our house. If I remember right it was September of 2001, my husband and I were in the hills riding as usual, we stopped on top of a bald saddle to look over the draws below. Kevin rode off a little ways from me to scan the other side, he came back a few minutes later and told me to follow him quietly that there was a bear in the draw right below us. We rode over to the edge and in the bottom of the draw in a clearing was the bear, since this was only the second bear I had ever seen in the wild, I was REALLY excited. The bear was approx. 100 yards away, he noticed us but didn't seem to care, he purposely walked further out into the clearing, walked up an open bank and stared at us. Then he slowly walked down to the bottom again, grunted and snapped his teeth, then slowly trotted into the brush out of site. Kevin said that he had seen that bear several times before while out riding, he was huge, and had a large white "V" on his chest, and every time he didn't seem to care about being seen, even with the dogs around. That evening we talked to the man that owned the land where we had seen the bear, we asked if it would be o.k. to hunt the bear. 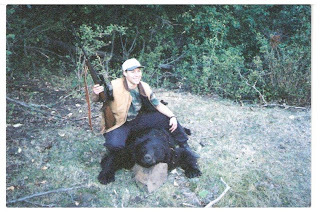 The owner was very happy to have us hunt that bear. He told us that bear had came down to his house several times, chased his horses through the fence, and killed a fawn directly behind his house. After a few minutes of hearing the bear crash through the bushes I finally saw him break out into the clearing, he was loping slowly in a strait line across the clearing. I aimed at the right shoulder and shot, the bear shoved back on his haunches, then lunged forward and continued running toward the edge of the clearing into the brush. I heard him crashing around in the bushes for a while then silent. 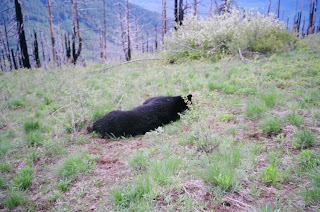 When we all got caught up with each other we approached the bushes with extreme caution, and found the bear dead.After dragging him to the bottom into the clearing we examined him and found that he was extremely old, he had an old bullet wound in his hindquarter, and his small teeth were all but worn down. He weighed 600 lbs, and was 7ft square, he was ranked 13th or 14th in the state that year. That is quite an impressive bear and one to be very proud of, congratulations! Thanks for sharing your story and I hope to hear about more successful hunts down the road. Seems that the Oregon bears have been kind to us huntresses. I'll keep my fingers crossed that it continues, but I won't hold my breath on that one. Oh my did Sam and I have our work cut out for us, no pun intended! We took a few pictures and then asked one another if we've ever skinned an animal out so as to make a rug out of the hide? We both had the same answer. . . No, I've only read about it and seen pictures. Well we begin the daunting task of skinning my spring black bear. It took us 3 hours to skin it with the head and feet in tact so he can be made into a beautiful bear skin rug. He was to big for us to hang whole, so we separated the front and hind quarters. Even doing that he was still a lot to lift. We rolled up the hide and I lashed it with parachute cord and bailing twine to my pack. I sat on the ground and got into my pack then asked Sam to help me up. By the time my legs came to weight bearing I thought my knees were going to explode, and I said put me down. There was no way I was going to carry that green hide on my own. Sam tried carrying it and was having a tough time too. I suggested we put it in my pullover, tie off the bottom and tie the sleeves together and then each grab a side and see how that works. It was better, yet still challenging. I am 5'6" and Sam is 6'4" and we were traversing a steep side hill. Not only that but it was slick from the rain and difficult footing with rocks interspersed. We'd set our sights about 50 to 75 yards ahead of us to the next little bush, or rock until we finally made it to the last steep downhill pitch. The weather was still holding out and we were thankful. It took us 2 hours to go a little over a mile to get back to the rigs. The last steep pitch we went straight downhill by- passing the switchbacks. We slid and rolled to the bottom where our rigs were, while keeping a firm grasp of the hide in my pullover. It's 9 p.m. and we're exhausted, scratched up, mosquito bitten and tick covered. Oh and hungry! Just as we get our gear put away and crawl into Sam's camper it starts to rain. We look at each other and didn't know what to do first, eat, get out of our tick infested clothes or go straight to sleep. I still had to go unfurl the hide and lay it in the back of my truck. While I did that Sam made us some sandwiches. I returned after my job and was so tired I could barely move my jaw to chew. Next we got out of our wet yucky clothes and into some dry gear. That felt so much better! Now I was wishing I'd brought a second set of hunting clothes, 'cause the thought of having to put those back on in a few hours was less than thrilling. We gave each other a tick check and hoped for the best. Then tried to get some sleep knowing tomorrow was another big day. Sleep was fleeting as the rain hammered and pounded the camper all night. In the brief moments we caught a wink, we were awoken by our paranoia of either a tick burrowing in or hopefully only a mosquito getting a quick bite. We got up at daylight after a miserable night and I was determined to go to the nearest town for breakfast and to get some DEET! Sam was in complete agreement and we had a great breakfast at a hippy joint with some strong coffee followed by a quick stop at the local super market for insect repellent. Then we were on our way back up the mountain to go and get the bear. We took only necessities such as cardboard to lay the carcass on while de-boning, some food, Sam's 41 Ruger Redhawk and some water. 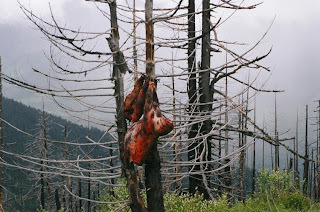 When we got to where the bear was hanging there were a hand full of Turkey Vultures flying low and waiting their turn. That was all, no other animal signs at all, phew what a relief. I was nervous about Cougars and was glad to have Sam and his 41 cal. with us. We began the work and it took us 2 trips packing meat out estimating our packs at about 40 lbs. each per trip. We didn't pack heavy cause we were whipped from the day before and it was only about a 40 minute trip one way. By the time we were finished we had over 2 dozen Turkey Vultures (TV's) circling and walking in on us and countless Ravens. We were glad to be done. The weather held with only a few light sprinkles beginning as we broke camp at 6 p.m. and headed home. Lucky or what? I'll take either! My shot had hit his spine just in front of his right shoulder and boy was that lucky. Turned out it was 220 yards downhill and we had figured about 150 yd. at tops. Good thing we have rangefinders now. It was my first day out ever hunting bears and my first shot at an animal with my(then new) Rem. 7 mm Mag with a Nosler 160 grain Accubond. I was able to recover the bullet too. The skull scored 19 7/16 just missing B & C's new cut off at 20". The hide measured 7' 6" green and is still right at 7' wide and a touch short of 7' long. He was 11 years old and had not been to any bait stations. The ODFW uses tetracycline as a marker at their bait sites which is identifiable in the animals teeth when they are aged. His back molars were rotten and cavity riddled. He had a few scars on his face and otherwise was in excellent condition. I was quite surprised at how lean he was and the fact that he hardly smelled. In talking with the biologist in Oregon who studies bears, he estimated his live weight to be approximately 400 - 450 lbs. 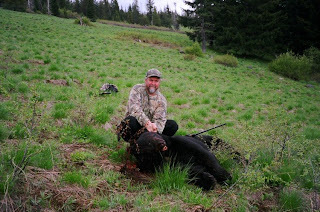 Also telling me that the average age of bears harvested in Oregon is 4 to 6 yrs. old with a few in the 20 age range annually, with the oldest being 30 that he's ever recorded. I spent 4 days cleaning the meat 1 piece at a time of fat and sinew. When I was all done I weighed it and had 125 lbs of very clean meat. I tried cooking a steak and that was a bit like a superball. So then I marinated a steak and after several days still had the same results. I finally decided that it was time to have breakfast sausage and summer sausage made. That was the best tasting of both. It was really good and I hope my knee will be good enough here this spring to take me on a few walks to do some sitting and glassing. It was well worth with it. Next time I will deet up and be better prepared with an additional set of hunting clothes too! This was an experience I will never forget. I only hope that I'll at least have the opportunity to harvest another bear. It may be a long time before I see a bear like my first one. Going to be a tough one to top, that's for sure. I want to thank Sportsman's Taxidermy in Bend, Or. for making a beautiful rug. Owner George Coyle is an exceptional artist and takes great care and pride in preserving each and every animal. His attention to detail is of the highest caliber and I sincerely thank him for all his work. If you're hunting in Oregon and need a top notch taxidermist, I highly recommend him. You won't be disappointed! I wrote about this hunt shortly after it concluded, and it is from that which I will share it with you all. So here is how it all unfolded. The waterfowl season was drawing to an end, which was a blessing considering how dismal it had been. My hunting partner John asked if we were going to put in for Spring Black Bear tags? My reply was that "I don't know" and his reply "why not"? to which I replied, "just never gave it much thought". He said, "well I think we ought to put in as a party". Well then so we did and there were four of us in that party. So we did some homework figuring which unit we wanted and then applied for the controlled hunt in the N.Cascades unit. This was early February and the application deadline was only a day away with the draw being on the 20th. of the month. Soon thereafter we got our draw results in the mail and we were successful and now had tags. The opening date was April 1 and there was considerable snow in the mountains where we wanted to hunt. We held off for awhile until we were just about out of time all together. John designated the weekend of June 3 and 4 for our hunt. As it turned out John was busy with work and his son Joe had other plans which left it up to Sam and I. We decided to follow through and go on our hunt. I talked with my friend Larry who gave me some areas to check and told me what to look for as far as sign and habitat. He was our resident expert since he had hunted bears successfully a year prior. I was all ears and taking notes as best I could. Then I picked up a couple maps for Sam and I to look over and we set a departure time for o dark hundred the next morning. We had the usual assortment of gear and food. Figured to camp out and hunt both days if needed, and I figured we'd do just that as I doubted we'd get a bear our first day out. We drove separate rigs to our hunting area and as daylight broke it was another overcast gray day. We had periods of sun breaks interspersed with light rain and drizzle. The temps were in the mid 40's to low 50's and quite humid. Sometimes the clouds covered the mountains making it difficult for glassing the edges of the clear cuts and meadows. The wild flowers were blooming and the foliage was becoming denser every day with the new growth. We were driving up near snowline stopping and glassing when we came across areas that looked promising. Eventually we figured out just where Larry was telling us to go. We could see the steep hillside from across the draw. It was an old clear cut that had been burned which had pockets of brush and old snags still towering. We drove until we ran out of road and then we grabbed our packs, rifles, bins and set out on foot. We found a brush covered trail and began our ascent up the steep hillside. From below we saw an enormous Elk in the meadow when we were glassing from across the draw. We watched the elk traverse the steep slope and top out then head down the other side. That was the last we saw of it. We suspected it was a bull just from its size. As we moved our way uphill following the switchbacks we were a bit soaked from the waist down from the vegetation and looked forward to getting up to the ridge line. The trail we followed merged into a major trail and we were now out of the wet brush. We stopped for a breather and decided to traverse our way to the top and see what it looked like on the other side. When we got to the top we didn't see much on the other side in the way of Bear habitat. Quite a lot of snow, rocks and a small steep of water. We decided to drop back down to the main trail and sit awhile and glass. On our way down we saw a wooden sign and wandered over to it. It had mileage to Oakridge, Crescent, Eugene and a few other places. I'll be darned if we weren't on the Pacific Crest Trail. WOW, we found a comfortable log and sat awhile and shot the breeze. We had company in the way of a pair of Three Toed Black Backed Woodpeckers flying near us in the snags. I have remembered these from a hangman's game I played with my brother when I was quite young. I didn't believe their was such a bird, just sounded a bit much. Well, yes in fact they are real and I have not forgotten them since. Also we were serenaded by the drumming of Grouse. One was close by and the other was around the headland from us and sounded as a distant echo. We hiked for a couple hours before we sat and started glassing some more. The rain had all but subsided and it had turned into a lovely afternoon. We had a snack and were conversing about this and that, the usual hunting drivel. We had a great place to sit and glass overlooking a large grassy hillside and beyond to the snow capped Cascade mountains. I wondered aloud if there were any bears in the area since we hadn't seen any sign. Sam replied as his usual optimistic self saying " at any time a big'ol bear can just step right out". Glancing at me with a sparkle in his eye and a mischievous grin. Mmmmm o.k. I replied and re situated myself on the log with a twinge of "what if" running through my veins and disappearing just as fast. It was almost 4 in the afternoon and as I glanced downhill on the green grassy hillside I was shocked to see a huge Black Bear moving from right to left. I said to Sam "there's a bear, a really big bear"! He said "Oh my god that's the biggest bear I've ever seen, shoot it, shoot it"! I said "I have to wait for it to clear those snags", Sam was looking at it through his scope too backing me up if needed. At this point everything was in slow motion and nothing else in the world existed. I steadied my shooting sticks took careful aim and squeezed off a round. I heard nothing but saw everything through my scope and was in even more disbelief when he dropped in his tracks like a ton of bricks! We looked at each other and words fell short of our emotions and I said we're gonna sit here 10 minutes before we start heading down. I wanted to make sure the bear was down for good. As we sat there we were both amazed at what just happened. The bear was able to raise his front left foot a little and turn his big brown nose skyward, but that was all. He was definitely down. We gathered our gear and Sam led with his Ruger Redhawk 41 cal. on point and I followed. We crept slowly downhill, ever cautious of our quarry and the few times he did raise his paw we both froze like statues! Then looked at each other and laughed at ourselves, yea quite the hunters we are. Yet this was a serious matter until we knew the bear was dead we remained quite alert and vigil to our well being. I told Sam that while looking through my scope, I couldn't see see daylight between the bears belly and the grass. He was so big and getting even bigger with each step we took. As we got to within 10 yards Sam asked me where did I want him to aim the kill shot? I said anywhere but the head. . . try for the heart if you can. This was the first time that either of us had been in this situation. Sam fired 2 shots and the bear died quickly. I saw the life leave his brown eyes. That was hard to watch for sure.